Is there a better alternative to shivering kittens? Is shivering kittens really the best app in Arcade category? Will shivering kittens work good on macOS 10.13.4? 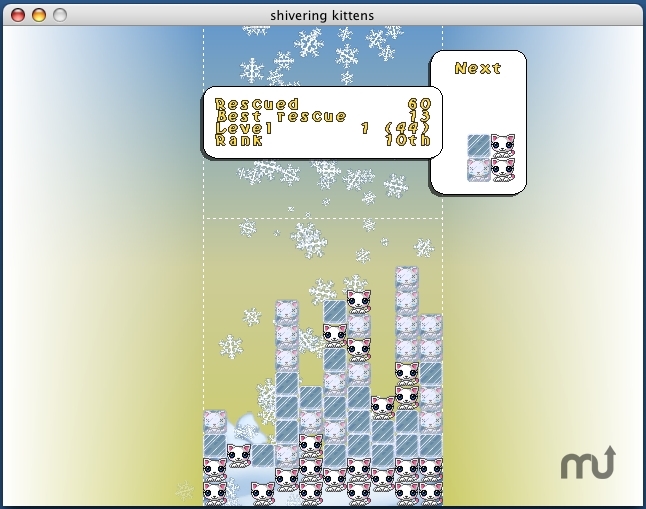 Shivering Kittens is a panic-inducing puzzle game for Mac OS X, where you must rescue kittens from their icy imprisonment! A block-matching puzzle game, shivering kittens tasks you with forming lines of frozen kittens to release them from their icy imprisonment, and then with forming groups of those thawed kittens to rescue them! fixed a bug where pieces would not fall if they were rotating or if they were moving horizontally. Mac OS X 10.3 or later, playable on PowerPC- or Intel-powered Macs (via Rosetta). shivering kittens needs a rating. Be the first to rate this app and get the discussion started!